You have a night time routine for other parts of your body, so why not your feet? Whether it’s squeezing them into painful shoes, playing sports or failing to give them as much attention as they deserve, our feet are often neglected. 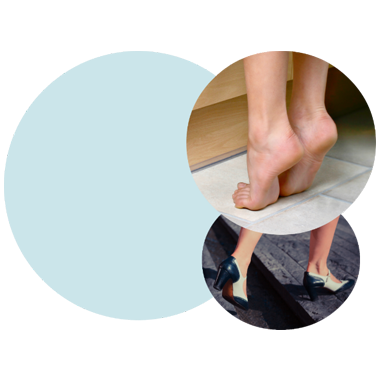 By adopting a simple maintenance routine, you can make your feet more comfortable and help to prevent common foot problems in the future. Here’s how to wake up to softer skin and relieved feet, so you’ll be ready to show them off the next day. If you’ve been on your feet all day, they’ll probably be ready for a bit of pampering by the time it’s evening. As well as catching your feet at their neediest time, a night time foot routine is the first step to keeping them healthy, soft and beautiful. Start by washing and drying your feet. Feet tend to get dirtier and sweatier than other parts of the body, so it’s good to get into the habit of washing them every night to get rid of bacteria. Pay extra attention to your toenails and the spaces between your toes. Next, you need to remove dead and hard skin from your feet. Doing this on a regular basis pays off, as it keeps your feet in great condition and helps to prevent more severe problems further down the line. A product such as the Amopé Pedi Perfect™ Electronic Foot File can be used regularly to remove any excess dry skin. 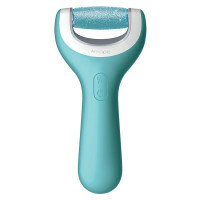 The roller gently buffs away hard skin in minutes, leaving you with fabulously soft and beautiful skin. Once you’re done, treat your feet to a long soak in warm water. This helps to relieve aches and pains and relaxes your feet after a long day. A good foot soak is a great addition to the water, as it can contains green caviar, marine serum and vitamin E to help relax and cleanse your feet. To complete your foot pampering, you need to moisturize to reduce any reoccurring dry skin. As you’re heading to bed, rather than showering or running around, your skin will have an uninterrupted chance to soak up all the hydration it needs. Amopé Pedi Perfect™ Daily Moisturiser is ideal, as it helps to hydrate your skin. Your feet will feel great – and you’ll be able to see an improvement too. Help get yourself relaxed and ready for bed by massaging the cream into each foot, kneading the soles to help loosen tight muscles and boost circulation. Finally, stretch your toes by gently pulling them back and forth to ease tightness and soreness. Remember that the skin on your feet is around 10 times as thick as on some other areas of the body, so it needs an extremely thick moisturizing cream. The ideal mask will provide long-lasting moisture to help support your skin’s hydration throughout the night. Apply before bed, then place a pair of cotton socks over the top and allow your feet to be pampered while you dream. You’ll wake up to softer, smoother, happier feet that are ready to face another day!